Announcing The Book: Bring Your Superpowers to Work! It’s always my intention that these blog posts are about you, your work and your success. Not about me. But I need to break my own guidelines for a moment, and share a little something about me that hopefully will be useful to you, your work and your success. 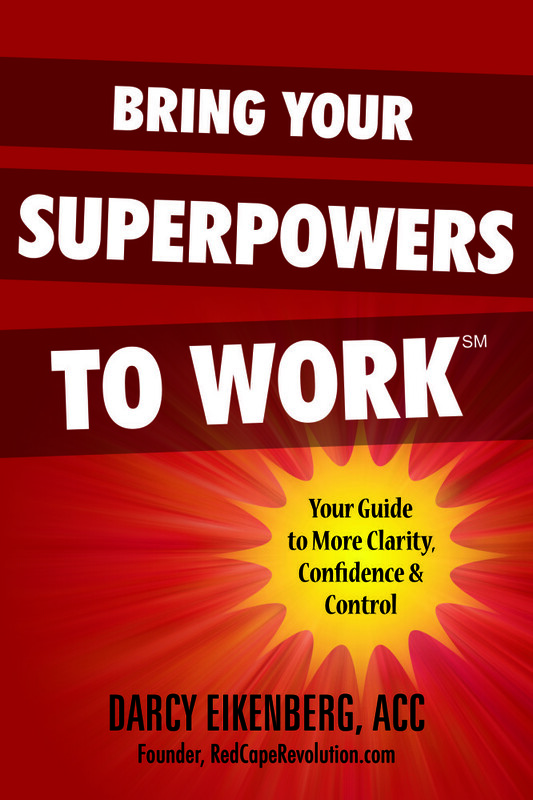 I’m officially announcing the book, “Bring Your Superpowers to Work: Your Guide to More Clarity, Confidence & Control,” and it will be released in January 2012! Yes, some of you careful readers won’t be surprised, since I’ve mentioned this book in passing. Others of you (intentionally or unintentionally) provided inspiration, ideas, endorsements, encouragement, and support. Most of all, every one of you–whether you just read this blog, have heard me speak, or have hired me as your coach–provided the motivation to get this effort done. For that alone, I am incredibly grateful to each of you, even those of you I’ve yet to meet. Between now and the January launch, you’ll hear more and have chances to win autographed copies and get complimentary downloadable chapters and tools from the book. (Make sure you don’t miss any of the fun by being part of our Facebook page, too.) You’ll also hear more about other 2012 programs and development opportunities we’re preparing for you at Red Cape Revolution. Q: Why a book? I heard they were dead. Books change lives every day. A book takes more than a few minutes to read. A book envelopes us, it is relentless in its voice and in its linearity. You start at the beginning and you either ride with the author to the end or you bail. And unlike just about any form of electronic media, you get to read the book at your own pace, absorbing it as you go. I do think the boring, hard-to-read, or irrelevant book is dead, or at least dying. I promise you there’s none of that here. A: It’s about an evil queen who gives the princess three wishes before she chops off the head of the, ah, WHAT DO YOU THINK IT’S ABOUT? Ahem. . .sorry, lost my mind for a second. This is the first book to share more about why we need this so-called Red Cape Revolution in our work and our world right now–ways that might surprise you. It offers proof that you actually do have superpowers–ones that are uniquely yours, and that are needed in your work and world. Finally, it’s filled with simple, practical ways you can discover your superpowers, bring them to your work, and start making a bigger difference in your career, your company, and your community. In short, it’s based on all the work we’ve been doing here at RedCapeRevolution.com, aimed to give you more clarity, confidence, and control in your career and even your life. In case this is your first visit to this blog, here’s some background that might help. What the Heck is a Superpower? You can also find out more about me here. Q: I’m thrifty/cheap/poor–can I get a free copy? Okay, Dad, I guess so. As for the rest of you, well, heck, I’m a generous soul. Yes, there will be complimentary copies as well as other freebies and bonuses to thank you for being here, and to celebrate the publication! Plus, if you’re a blogger who reviews books, or someone willing to share your review on Amazon, we’ll get it in your hands. Watch our Community News as well as Facebook page for more. Q: I have an idea of how you can spread the word about your book. Wanna hear it? A: Of course! There’s only so much we can do from here to tell other amazing people like you how they can be even more amazing using the tools in this book. If you have an idea or opportunity for us to share this book’s ideas with your professional contacts or even friends in the media, just reach out here. And thanks!